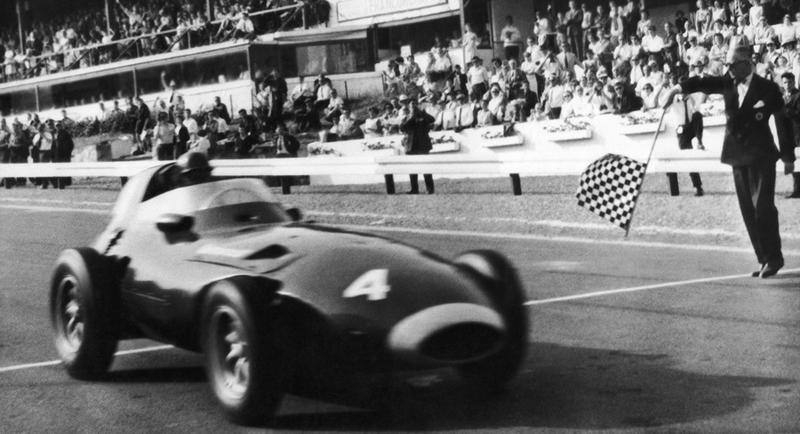 For the second successive grand prix the British manufacturers dominated and a British driver - this time Tony Brooks - won. And as had been the case at Zandvoort, only Mike Hawthorn's Ferrari prevented a shut-out at Spa, the Times reporting it "gave out in a cloud of smoke and steam as he crossed the line". The only blot on the day was that championship leader Stirling Moss' Vanwall only lasted one lap. Moss had surprisingly been out-qualified by the Ferraris of Hawthorn and Luigi Musso and was determined to make his mark from the off. But a hastily-snatched gear change saw his revs soar through the roof and the Vanwall's engine prompty expired. Moss was out on the opening lap, and come the end of the season that was to prove decisive. Moss' team-mate Brooks rose to the challenge but struggled to keep Peter Collins at bay, but after five laps Collins' Ferrari overheated and then on the same lap Musso ran off the road and out of the race. Hawthorn tried to get back on terms and managed to clip seconds off Brooks' lead every lap, even setting a lap record on the final circuit, but he could do no more than split the Vanwalls of Brooks and Stuart Lewis-Evans. Overcome by fumes, he had to be helped from his stricken Ferrari at the finish . Cliff Allison came fourth, scoring not only his first points but also for the little North London marque Lotus.